VENTURA COUNTY, Calif. (KABC) -- Though the Thomas Fire is now 70 percent contained, there are still more than 2,000 firefighters working the blaze, and for many of them, it's their first Christmas ever fighting a wildfire. The Thomas Fire, which charred 273,400 acres, is now the largest wildfire in modern California history, according to Cal Fire. Since many of them couldn't be with their families on Christmas, Santa brought Christmas, and a hearty thank you, to them Sunday. 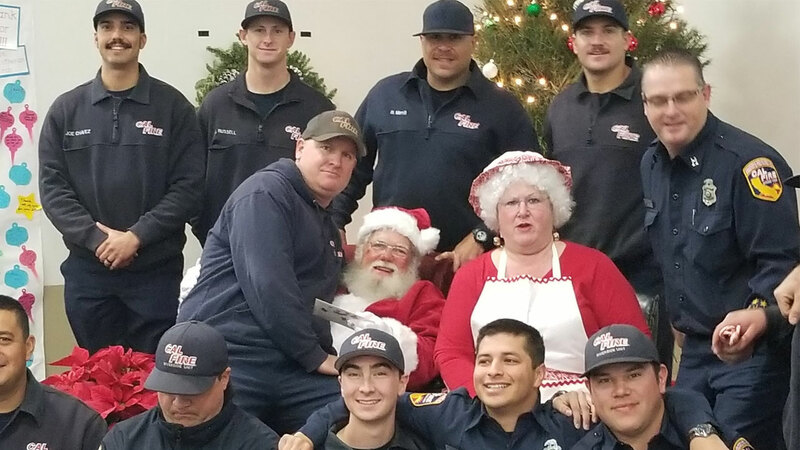 The Ventura County Fire Department tweeted out a photo of some of the hardworking firefighters posing with Santa and Mrs. Claus. "He knows a little about working during the holidays," the tweet said. The largest wildfire in California's history has consumed 273,400 acres and destroyed more than 1,000 structures across Ventura and Santa Barbara counties and has required thousands of hours of labor for firefighters from around California who responded to the blaze. Though no forward progress on the fire is expected, fire officials say fuels in the burn area remain "critically dry." Firefighters remain on standby ready to respond to any Thomas Fire flare-ups or new blazes in the area. It was an emotional sight on Southern California roads Sunday, as hundreds turned out to honor slain firefighter Cory Iverson. Firefighters working the Thomas Fire and around the state were dealt a heavy blow Dec. 15 when one of their own was killed in the line of duty. Cory Iverson, 32, a fire apparatus engineer with Cal Fire's San Diego Unit died of smoke inhalation and thermal injuries in the Fillmore area as flames raged in the hillsides above the town.